a combustible plastic bin or bag even several days later. Never store or dispose of hot ashes in a combustible plastic trash container. This one simple action is one of the major causes of home fires and has turned many memories of a delightful, cozy evening fire into a disaster. After a few hours in the plastic trash container, the ashes have ignited the trash container and suddenly the garage and house are on fire. 1. DO NOT remove hot ashes from the fireplace immediately. Wait up to 2-3 days and let the ashes cool completely in the fireplace until there are no remaining hot embers before removing them. 2. NEVER put fireplace ashes in a combustible plastic trash container because it can easily ignite. If you have to remove the ashes from the fireplace before they are completely cool, put the ashes and remaining hot embers in a metal bucket. 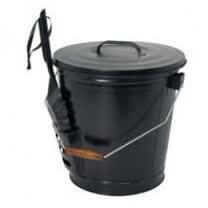 Move the bucket outside the house and garage and well away from anything that is combustible. 3. ONLY put fireplace ashes in your combustible plastic trash container when they are completely cool and after you have put your trash container out on the street for trash pickup. These are 3 simple steps that can prevent unnecessary inconvenience or tragedy. If your household uses a wood or coal burning fireplace it is equally important to have your chimney inspected and cleaned annually by a professional. 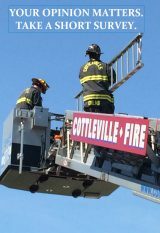 If you have had a recent experience with the Cottleville Fire Protection District please take a few minutes to let us know how we did. We appreciate your feedback! Don't forget to change your Smoke Detector Batteries! © 2019 Cottleville Fire Protection District. All Rights Reserved.Website by Spencer Web Design, Inc.